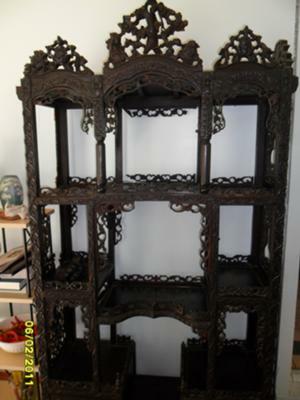 My Chinese Curio is approximately 39 inches wide by 15 inches in depth and 73 inches high. 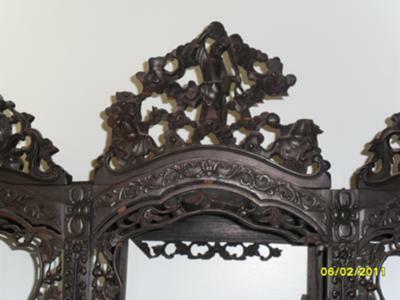 It is a finely carved piece of Chinese furniture that I received from my uncle who had it in storage for over 30 years in Vermont. 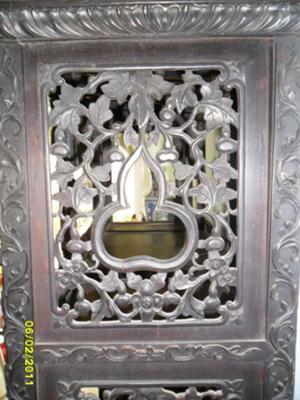 My uncle believed it was Japanese and it had been in the family since the early 1920s. He received it from his mother who, with my grandfather, owned a local tavern in Monticello NY in the early 1920s, (which still exists to this day). The Rockwell hotel across the street purchased their alcoholic beverages from my grandfather. According to the story, the owner of the hotel owed my grandfather a debt and this piece of furniture was given to him to settle the debt. He was told that Admiral Perry, on his trip to Japan, brought the piece back with others and the hotel acquired it. After travelling to Vermont with a trailer and returning to NY, I simply cleaned it well and attempted to replace the many pieces that were stored away in the two bottom drawers, both with locks but only one with a functioning key. I did in fact travel to the Smithsonian Museum in Washington and after inquiring about my Chinese curio, I was given a visit to the curator at the time, a stark white haired tall and heavy set man. He viewed my photo’s and mused for a moment over them and took me behind the exhibits. Which to my amazement contained seemingly more than on display. 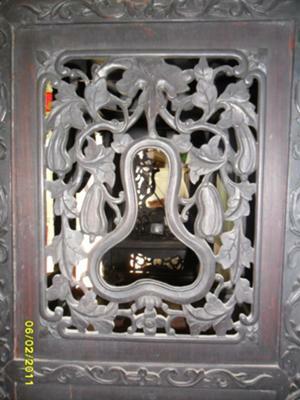 He showed me a similarly carved Chinese Curio, of simpler design and less detailed but the main vertical posts were carved and very similar to mine. I knew then it was Chinese. The central figure of a dancing old man flanked by two seated fellows offering different gifts lead me to believe they were the Ho-ho twins and traditions states they were associated with weddings. That was the extent of my search. I have attached a few photo’s of my Chinese curio and would welcome any comments other collectors would like to offer.